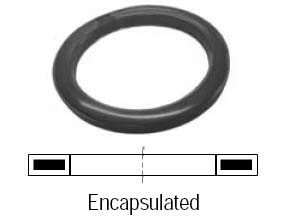 # DIX75-G-TEV - Encapsulated Teflon Cam and Groove Gasket - Viton - 3/4 in. # DIX75-G-TEV - Encapsulated PTFE Cam and Groove Gasket - Viton - 3/4 in. The torque (force) required to close the handles on a pair of cam and groove fittings will vary according to the gasket chosen. Due to the nature of the PTFE material, the various PTFE gasket designs will require the most torque, increasing as you go from envelope to encapsulated, and finally, accordion. PTFE encapsulated Viton (TEV) gaskets - maximum operating temperature 200°F. Encapsulated gasket pressure ratings are reduced to 125 PSI for 3/4" - 4" at ambient temperature (70°F).